Finally! Headaches natural remedy ideas coming up! Are you plagued by headaches or migraines? Determining the cause can help alleviate symptoms. Play the detective. Here are just five of the many possible causes and some tips on how to help a headache. Hypoglycemia results when blood sugar drops, when a meal is delayed, and often combined with a lack of protein. Some people experience symptoms such as, shakiness, dizziness, nausea, irritability, trembling, trouble concentrating and headaches or migraines. How do you feel when a meal is delayed? One client I worked with, had been suffering with debilitating migraines for years and was taking a strong anti seizure medication for it. Her migraines always occurred first thing in the morning following a meal that had very little protein the previous evening. This caused hypoglycemia and triggered her migraines. Added to this she drank very little water. For that reason her migraines would last for days, where as if she had been drinking a lot of water she would’ve gotten rid of her migraine much faster. In this instance, ensuring adequate protein intake, eating more often, reducing refined carbohydrates and sugars is key. Bathed in saline solution the brain is the most hydrated organ in the body. A lack of water can trigger or prolong headaches. How to help a headache? 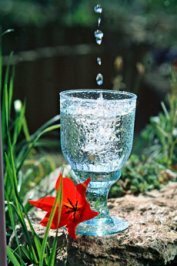 If you have a headache drinking two or three glasses of water can reduce the pain! Your weight in pounds divided by two, indicates the approximate number of ounces of water to drink per day. For each cup of coffee, tea or alcohol add in another cup and a half of water to compensate for the diuretic effect these beverages have. Keep track of your headaches or migraines and note when they occur. I had a client do that and it was clear that her migraines occurred during the time that she was ovulating and right before her menstrual cycle. By taking some simple supplements to balance her hormones she was able to find relief. If you suffer from headaches, eating a diet with a variety of healthy, whole, fresh foods is essential. Chemicals, additives and food coloring in packaged, processed foods can trigger headaches. Sugar and anything containing it should be avoided. 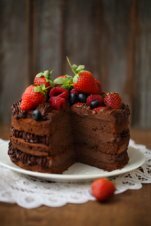 Possible food intolerances for migraine sufferers include chocolate, alcohol, citrus or aged foods, to name a few. Tightness in the neck and shoulders indicate tension headaches. Stress management is key. Practice deep abdominal breathing regularly or try yoga, meditation, a massage or taking a walk. Proper spinal alignment by an osteopath or chiropractor can also help. There are other reasons for chronic headaches and migraines, such as a congested liver, eye strain, anemia, magnesium deficiency and hypothyroidism. Identify and start addressing what is imbalanced in your body to find relief. 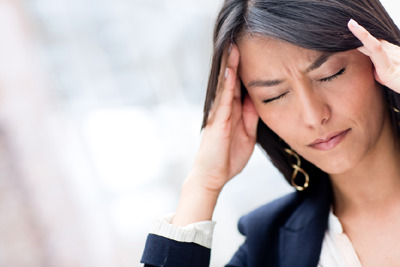 Book a consultation today and learn how to help headaches and get permanent relief.